I’ve mentioned it here before, but I am currently working on a full-time Master’s degree in Creative (Non-Fiction) Writing. I also have a job that mostly involves writing and editing. I also have this blog, and other freelance assignments, so… you guessed it, more writing. Across the board, everything I write has some sort of connection to travelling. While I hesitate to call myself a travel writer – that’s not exactly what I do – I sure as hell do a lot of travel writing. And the more I do, the more I realise I’m not very good at it all the time. Over the last year and a half, my degree and my job have taken up most of my life. I have sadly had to let this blog slip behind a little bit, which breaks my heart. I love writing blog posts. Sometimes I go back and read old blog posts for inspiration for the book I’m writing, and once in a while I feel really proud of what I’ve written. A lot of the time, however, I cringe. I’m totally guilty of doing some really lazy travel writing. Lock me up and throw away the key, because I have definitely described a city as a “fascinating blend of the ancient and the modern”. So, mostly out of sheer self-shaming (in the hopes that I never blog/write using these words again… or at least minimise my use of them) here are the words I think are overused in travel writing and travel blogging. This list is purely my subjective opinion, snark and all, so I’d love to hear your thoughts and your additions in the comments! 1. Amazing… and all those other superlatives. I wrote a strange introduction to this art museum in Cyprus in which I describe how often I use superlatives. I’m sure many of us are guilty of it. Think about it: how often do you say the words amazing, cool, awesome, or brilliant? And, because we think we need to be just a bit classier when we write, how often do you write the words fascinating, interesting, fantastic, stunning, gorgeous, wonderful, terrific, and the best? I don’t think that using these words in travel writing is awful… the problem occurs when they’re the only words that are used at all. I’ve read so many pieces about places that – if literally taken word for word – would mean that that place is undoubtedly heaven on earth, it is so mind-glowingly amazing (see: half my blog posts). Now what I do after each blog post or article I’ve written is a word search for words I know I’m guilty of overusing. I recently wrote an article only to discover I’d used the word beautiful six times in eight hundred words. Okay, yes, the place really is ridiculously beautiful, but using that word that many times is just being negligent. Be creative with your vocabulary choices, but don’t go overboard with the thesaurus, either. If the reader can’t immediately figure out what it is you’re trying to say or trying to describe, he’ll tune out completely. Big words don’t equal great writing. 2. Quaint. I find this word a bit patronising, as if you’re patting the town you’re describing on the head. I’ve used it before on this blog: “My favourite places are tiny Pai and quaint Popayan, sleepy Kampot and relaxed Mendoza.” Whoops. It just strikes me as a lazy word, though I understand the desire to use it – there aren’t that many words that mean the same thing that aren’t as overused, too. Picturesque? Charming? Whimsical??? Yikes. 3. Hidden gem. From my searches on this blog, and through my (shaky) memory, I am pretty sure I’ve never written the words hidden gem on here. Why? I think it’s a phrase that once carried a bit of weight, but now seems quite clichéd. I recently saw an article that listed Florence as a hidden gem. What?! This is the kind of phrase that should make a writer use her imagination: how else can this idea be explained? Off the beaten path falls into this category, too. 4. Delicious. I have nothing against using this word to describe food. Food can indeed be very delicious. The problem I have with this word is when it is used to describe something other than food. Same goes for scrumptious, tasty, and for… *and I gag*… yummy. Whoever first uttered the phrase yummy mummy should be forced to never eat anything scrumptious, tasty, or delicious again. I found this list of words that can help describe food (it also has a good list of synonyms for the dreaded “amazing”). 5. Must-see. I’ve always found this phrase to be a trifle bossy. Oh really? I simply must see it? Or what?? To be fair, I’ve used it on this blog before: “The best places to see street art in Berlin are Mitte, Kreuzberg, and Friedrichshain; another must-see is the alleyway off of Rosenthaler Straße, where many different artists have worked together to create a spectacular, ever-changing gallery.” I definitely could have come up with another phrase there. 6. Exotic. To describe something as exotic, by pure definition, means that the thing you’re describing is from a foreign land. Pretty simple and straightforward. I’ve used it on this blog before: “One Friday I walked through Antigua Market, caught in the chaos and the exoticism: the ripening fruit spilling into the aisles, the fluttering paper wisps of piñatas, the air perfumed by bunches of lilies and fly-covered meat.” The problem I have with this word is when it is used to describe a person. “Exotic locals” don’t exist. Similarly, I despise when people describe a person’s looks as “exotic”. No – you’re just presupposing a shared cultural context. Technically speaking, if you’re in a foreign country, you’re the exotic one. 7. “Real”. I can’t stand when people say they’ve discovered the “real” Thailand or the “real” Paris or whatever it is that people think real means. If you’re in Thailand, you’re in Thailand. Whatever you see around you is real, and whatever you see around you is now a part of the Thai culture. Just because something doesn’t suit your assumed image of a place doesn’t mean that it isn’t real. I also shudder when I read or hear the word “authentic”, which I wrote a whole blog post about here. 9. Love. I use the word love so much on this blog that it shows up in a search on thirty three pages with an average of ten posts per page. Damn. A rough count saw that I have used the word love in the title of over thirty posts. I just really love a lot of things, okay guys?? But yes, I should try to cut it back. We can’t truly love every place we visit, just like we can’t love every single person we date. Besides, the opposite experiences usually make for the best stories anyway… both with places and with dates. 10. Adverbs. I recently read Stephen King’s On Writing – a book I recommend for all writers, fiction and non-fiction alike – and one of the things he emphasised was to cut out as many adverbs as possible. I had heard that before, but for some reason it stuck with me this time. And it’s true… why do we need to say she ran quickly, or that he shouted loudly, or that she pleaded abjectly? These are all presumed by the verb you used. This is also connected to that classic adage in writing, show, don’t tell, which I try to implement in my writing every day. Don’t tell us how she felt… show us, through her body language and her dialogue. Oh yeah, and I’m also trying to cut out almost every “very” and “really” from my writing. I’m not really angry, I’m furious. I’m not very happy, I’m elated. 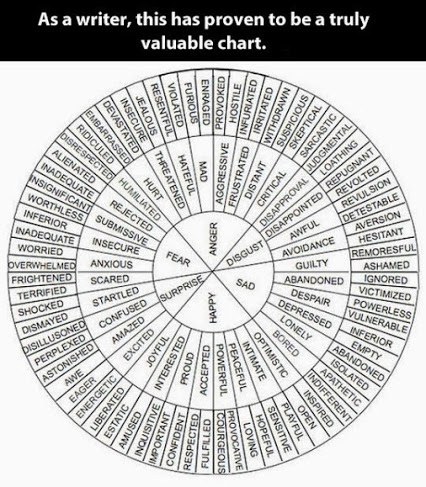 Here are a few more good ‘feeling’ words to use. Bonus overused words: epic, sun-dappled, nestled, friendly locals, bucket list, foodie, magical (I’m totally guilty of that one), “I’ll be back one day” (also guilty of that a lot) and, let us not forget, a “fascinating blend of the ancient and the modern”. One of the best books I’ve ever read on travel writing is Smile When You’re Lying by Chuck Thompson. Gritty and hilarious, it will make you think twice about using some of these words again. What do you think? Do you agree with this list? What else would you add? I don’t mind that word! I HATE the expression “must-see”. It makes me want to be contrary and not see the place. Though I definitely am guilty of superlatives and loving everything… I just feel superlatively in love with every place that I visit! But yes, that should probably be toned down. Ha ha… I’m with you! I feel the same way. Unfortunately I think I use all those words too often..eekk. But now I will consciously try not to! Great piece! Yes, I think that is definitely overused, too! I say it a lot but rarely write it. Thanks for the comment! This post makes me laugh. It can be difficult to come up with anything unique in travel writing anymore when everyone’s doing it and we’re all reading each others’ writing. I would love to read On Writing and Smile When You’re Lying, I’m sure I could learn a lot from those. One particular phrase I wish would wither and die is “an incurable case of wanderlust.” Gag me. The word “wanderlust” by itself grates on my nerves anymore. Along the same lines as your paragraph about the word “real,” I think “authentic” is overused and so completely subjective that it almost has no meaning. I still really love the word wanderlust, as I don’t really know another way to describe what I feel (“itchy feet” isn’t a favourite phrase of mine, either). I agree that the word “authentic” is extremely subjective! Feel the need to be more creative… And you’re making me want to do this masters more!! Le sigh… I am so so so guilty of the above. Especially love, must-see, magical, and the superlatives. Thanks for the motivation to get a touch more creative. The world could always use more imaginative writing. We’re all guilty of them, don’t worry! I have struggled so much starting out with my blog when it comes to descriptive words, and know I’m guilty of overusing so many of the cliche redundant ones. I agree with what you said about ‘you’ being the exotic one! Stephen King’s memoir on writing is brilliant- (I feel like this is a time this word is definitely allowed!) so many great tips. I know I will come back to this post from time to time to help with my own writing- thanks! Also, need to get my hands on that last book you mentioned by Chuck Thompson, sounds like a good read! “Bustling marketplaces” is one I feel like I see a lot (and am guilty of using too)! I’ve definitely used that one… and you’re right, it’s overused! This was a great read! I’m definitely guilty of overusing all these words, especially when it comes to superlatives. Just reading “yummy mummy” made me cringe, ha. I hate when people use scrumptious and yummy to describe a person! I don’t think I’d ever refuse to read something just for using a certain word, but I agree that there are some phrases that really make me roll my eyes! I’m with you on “digital nomad”… again, just so overused. I am also not a fan of anyone calling themselves a guru, ever. Haha, I love this post, and yes, I’ve been guilty of most of these, too. The one I hate the most is ‘friendly locals.’ Maybe it’s the cynic in me, but I know that more often than not, there are loads of not-so-friendly locals, too – let’s hear about them as well! Yes, it’s such a cliché to say “friendly locals”! Oh great, glad that it will help! Yup, beautiful is definitely up there for me. I use ‘unfortunately’ rather a lot too. Haha! Ha! I read King’s _On Writing_ several years ago and have struggled with adverbs ever since. I know I over-use them, but I just. Can’t. Stop. Maybe seeing the rule here again will help! I know, I need to constantly remind myself of it when writing! Oh man, this made me laugh. I do some travel writing too (at The Culture Trip – I think we did a piece on you recently? I really hoped they’d include you when I saw the topic!) and I am guilty as charged of 90% of these. I’m guilty too, don’t worry. And yes, I was featured on the Culture Trip recently, thank you so much! This is so true and I can’t say I’m not a part of it. I keep working more and more on improving my vocab, but I have to admit the years of not writing much has increased not the words that I know but the ones that I go to instinctually. I like to think I keep improving but I plan on continuing to work on it. Do you have any tricks? The only things I’ve found will help are to read every day and write every day. That’s it. It sounds simple, but it’s the best way to become a better writer and expand your vocabulary! Oh, this made me laugh. It’s so true and I’m so guilty. Feeling like I can’t share a travel experience without using a whole lot of cliches is one reason why my blogging has decreased so much over the past few years. I’m amazed that you can write for so many outlets and still find new and interesting ways to express yourself. A true testament to your talent. Glad I could make you laugh, Jill! And thank you so much for such a nice comment, I definitely struggle with cliches every day, but I look at it as a challenge to push my writing to be as best as it can be. A lovely post – I am guilty as charged your honour. Will try harder I promise! Ha ha – this is just my own personal opinion! made me laugh ) I agree with all of them except “Real” .. sorry darling, but if you’re staying in a 5 star resort in Kenya and being flown to Masai Mara by a private jet, I have the right to tell you, you did NOT see the REAL Kenya!! But that’s just my small opinion on the matter. Same goes for Cuba and other places. It was fun to read your post. How come I didn’t find this ‘hidden gem’ before today? I hope I don’t pepper my copy with too many clichés. It’s certainly something that all writers need to think about. Hahaha, I had a good laugh at this! I always imagine some snails when i hear “meander”, it´s some weird association I have. So definitely not using it! Actually, i´ve never used many of these (guilty of a lot of thesaurus googling, oops) – maybe because i am not a native speaker and i am more guilty of directly passing my own language clichés to English than using the original ones! I use more picturesque than quaint – I´m not really sure what quaint is supposed to mean. Oh, and I´m a “bucket list” hater. Since when it became clear that it is a “must” to have one?